The first references on wheat harvested by man for food come from some early forms of the cereal found 12,000 years ago. Some later findings of charred remains of bread wheat (Triticum dicoccoides) and grain shapes in baked clay were done in Jarmo (northern Iraq) and dated to the year 6700 BC. The origin of domesticated and possibly cultivated wheat, was found in Asia in ancient Mesopotamia, in what is now known as Syria, Jordan, Turkey, Israel and Iraq; from there it was dispersed in all directions in the ancient world. Possibly it comes from South-West Asia, a region known in ancient times as “Fertile Crecente” or “Fertile Crescent”, a very fertile area that today is a desert. The meaning of the word wheat is “crushed” which has an important connotation because only when man threshed it into stone, actually recognized its value for food; otherwise it would not have succeeded in its natural state. Wheat was well appreciated in ancient times because it is a relatively easy to store for long periods food, solving the nutritional needs of populations during times of food shortage. In Europe in the seventeenth century large areas were grown, and along with rye and barley these were the most accepted grains. The Europeans introduced cereals to America later, during the colonial period and found large tracts of optimal land in the semiarid regions of North America: United States and Canada, where it spread while being transported and marketed with the railroad, growing on either side of the rail lines. The global wheat production estimated by the United States Department of Agriculture, USDA, for the year 2014/2015 was 725.03 million tons. The biggest wheat producing countries with 68% of the world production are the European Union, China, India, Russia, and the United States. Production in the Americas represents only 4% of global production and is estimated at approximately 28 million tons, of which Argentina, Brazil, Mesoamerica and the Caribbean, and Mexico produced 96%, accounting for US$ 217,000 million in exports for these countries; very important resources in the trade balance in 2013. As a whole, wheat, corn and rice account for 50% of global food consumption; given that the world cereal production in 2014 was 2.534 million tons, wheat participated with 28.6%. Biblical texts speak many times about wheat, and one of the best known religious principles was that “man had to earn his bread by the sweat of his brow”, and wheat is required to make bread, so men had to struggle to mill it and thresh it to obtain the grain and flour from the fruit. Furthermore, wheat is a very rich food that contains carbohydrates, proteins, fats, minerals and vitamins. The world average consumption is 95 Kg / person / year. After separating the grain, wheat is mainly used as flour and a large number of popular foods in modern life are prepared with it; we depend more on it than in ancient times primarily in bakery and pasta, also the fermented grain is used for making beer, alcohol and vodka or biofuel. Wheat grains are rich in energy (3.47 Mcal / Kg.) and those that do not meet the milling industry requirements, broken, shrunk or moisture damaged that meet sanitary quality, are utilized for animal feed. Wheat represents a great source of food to supplement feed rations for cattle and, even if in small amounts, is used as green fodder or silage. The starch in wheat serves as energy reserve in the animal kingdom; it is in small discrete corpuscles called granules of 11 to 41 microns present in the seed endosperm, rich in amylopectins: 76% and amylose: 24%, and widely used in the food industry; wet milling is required to obtain them. Wheat is also a food rich in proteins, which are present at 10 to 12% in its flour. During its fermentation it presents a particular bulking feature, very important in bakery and that only occurs with another cereal, rye. Wheat is also rich in vitamins and minerals; based on 100 grams of edible portion we could estimate that it contains 36 mg of calcium, 4.3 mg of niacin, 3.1 mg of iron, 0.57 mg of thiamine and 0.12mg of riboflavin, it does not contains vitamin A or vitamin C.; looking at it in this way, we could say that it has a higher percentage of components that maize and rice. The growth and development of wheat plants are a consequence of phenological events, which are influenced by the interaction between its genetic characteristics and the environmental conditions. Wheat, Triticum spp, also known as trigo, quamhh, blé, wiezen, frumento, komigi, pshenitsa and bugday, is an annual monocot belonging to the Poaceae family which includes all grasses.Figure: Phenological development stages of wheat, and some key processes and inputs required for modelling crop growth and yield. 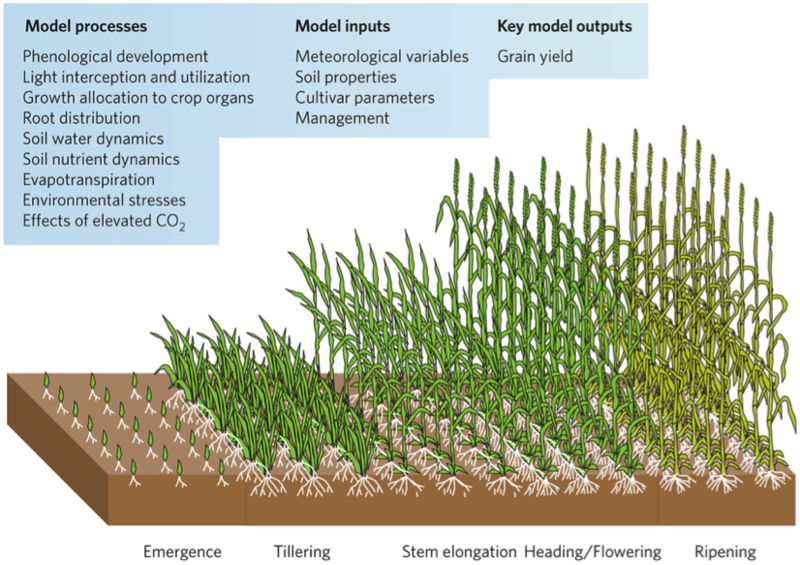 Figure: stages of wheat, and some key processes and inputs required for modelling crop growth and yield. Some features of the various structures of the wheat plant are: the root is dense and fasciculate, it develops from the crown, branches some 30 cm and can deepen in the soil up to 150 cm. The stem is cylindrical and straight with solid nodes and hollow internodes; it varies in thickness and grows to between 40 and 180 cm. The leaves grow from the stem nodes, are linear and alternately arranged, and their color is green, changing according to the growth stages. The head is composed of sessile spikelets attached to a winding axis of the inflorescence; commercial varieties are generally bearded. Lastly, the fruit or grain are caryopsis, oval with rounded ends into one of which is the embryo and its coloration can be white or red, depending on whether it is winter or spring wheat. Wheat grows at 25°C with minimum temperatures of 3-4°C and maximum temperatures of 30-38°C. Although it is considered a xerophytic plant that adapts to dry environments with water shortages and adapts well in arid regions, the crop requires moisture availability during times of germination and vegetative growth; high rainfall and strong winds can cause major losses. Wheat genetics are varied, some species are diploid (T. monococcum) with pairs of chromosomes and others tetraploid (T. dicoccoides. ), or with six pairs of chromosomes (hexaploid). Wheat varieties have been developed considering the development habit and the cold requirements needed for each variety, to switch from the vegetative to the reproductive stage. The kinds of varieties can be winter, spring or alternative habit. Winter wheats require cold periods to bloom and present vernalization, whereas in spring wheats vernalization is nearly zero. The stages of wheat development, from germination to harvest, are very important to consider for IPM, because they determine the severity characteristics of a disease, or the importance of an insect or a weed. These phases could be: germination, seedling stage, tillering, stem elongation or jointing, booting, spike emergence, flowering, watery kernel, milky, dough and semi-hard, and finally grain maturity and harvesting. The duration of the different growth stages of wheat depends on the genetic condition of the variety, whether it is winter, spring or alternative, and on the weather patterns during that season, but it usually ranges from 60 to 150 days. This variation depends mainly on the rate of emergence of the leaves and the floral differentiation time, which are determined by photoperiod or luminosity and temperature. Often two leaves develop in one stem and other times this is delayed, because of the effect of temperature, and water and nitrogen deficits. So for example, for hybrids or hexaploid the vegetative and reproductive Growth Stages, GS, in days are: seedling emergence GS 10 days, complete emergence GS 12 days, terminal spike GS 30 days, complete spike emergence GS 51 days, flowering GS 61/65 days, grain filling GS 71/85 days and physiological maturity GS 87/92 days.